The histopathological bodies are either intracellular or extracellular abnormalities specific to certain diseases. These structures appear either within the cell nucleus, the cytoplasm or may be present in both, exhibiting characteristic staining properties. These represent peculiar morphological alterations in a tissue giving rise to a highly specific pattern. The presence of histopathological bodies is often an important diagnostic aid in identifying the underlying disease. Hence, the present article is an attempt to compile different histopathological bodies seen in various diseases with special emphasis on pathogenesis, microscopic and ultramicroscopic features of the same. Histopathologic bodies seen in physiological conditions. Bodies seen in viral infections. Bodies seen in bacterial infections. Bodies seen in fungal infections. 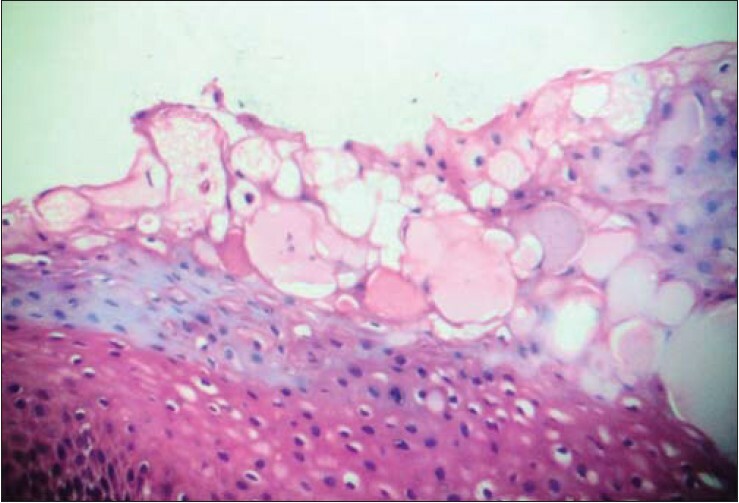 Histopathologic bodies seen in various neoplams. Histopathologic bodies seen in autoimmune diseases. Histopathologic bodies seen in blood dyscrasias. Histopathologic bodies seen in cystic lesions. 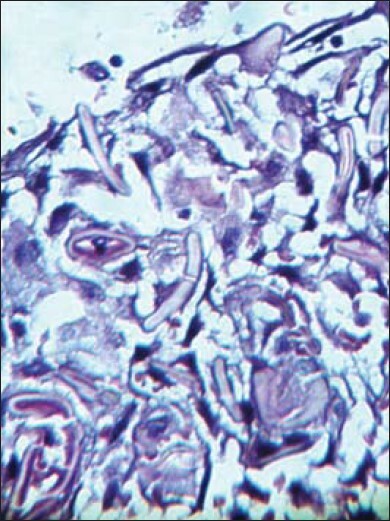 Keratinized stratified squamous epithelium is known to show Odland bodies. They are also known as keratinosomes, lamellar bodies or membrane-coating granules. These bodies are seen in the upper spinous and granular cell layers. These bodies are rich in glycolipids and are discharged extracellularly to form a lipid rich permeability barrier preventing absorption of aqueous fluids. Storage granules of th endothelial cells are known as Weibel Palade bodies. They store and release two principal molecules, von Willebrand factor and P-selectin, and thus play a dual role in hemostasis and inflammation . Some reactive lesions like epulis fissuratum in which there is an inflammatory fibrous hyperplasia of the surface epithelium, the epithelial cells show mucopolysaccharide keratin dystrophy which appears to have replaced individual cells. This is referred as 'plasma pooling' and this altered appearance is termed as 'Toto bodies'. Toto bodies are homogeneous, eosinophilic pools of material in the superficial spinous layer of the surface epithelium [Figure 1]. Some of the benign nerve tumors show a unique histopathological presentation like the presence of oval aggregates of eosinophilic globules containing parallel slits observed within the cellular sheets of neurofibroma. This peculiar presentation is known as 'Wagner- Meissner body'. This histologic presentation is seen in neurofibroma, and oral lesions of patients with von Recklinghausen's disease of skin, however Wagner- Meissner body is not pathognomonic. , Schwannoma, a benign nerve sheath tumor, shows compactly arranged spindle shaped cells with a palisading pattern. This presentation is unique and pathognomonic to this tumor and can be very well appreciated in routine histopathology as Verocay bodies [Figure 2] , Numerous benign and malignant epithelial and connective tissue tumors show 'Psammoma bodies' and the presence of these bodies categorize these lesions as psammomatoid variants of the family of these tumors. Lesions like psammomatoid juvenile ossifying fibroma, psammomatoid melanotic schwannoma, cystadenocarcinoma, psammomatoid meningioma are known to show psammoma bodies [Figure 3]. 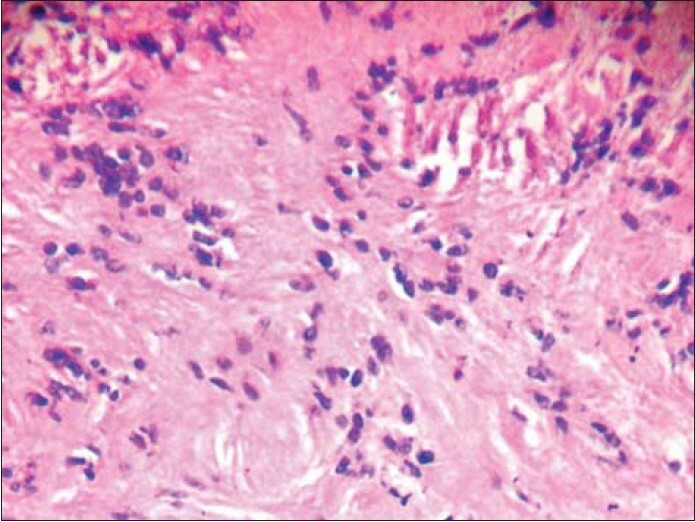 In routine hematoxylin and eosin stained sections they appear as spherical, concentrically laminated mass of calcified material. This histopathological presentation is formed due to necrosis followed by dystrophic calcification as its consequence. ,, Russell bodies, Pustulo- Ovoid bodies, Kamino bodies, and Dutcher bodies are few other examples of histopathologic bodies seen in the benign and malignant cells of a few rare neoplasia. Careful examination of the entire section may show the presence of these bodies in routinely stained sections Russell bodies appear as eosinophilic, large, homogenous immunoglobulin inclusions usually found in plasma cells. Several theories are put forward to explain the appearance of Russell bodies in the histologic sections of which the first one is by Downey (1911) and Kingsley (1924) which suggests that the death of plasma cells and their content is liberated in the surrounding tissues. Blood disorders comprise of a wide range of diseases. They are known to have a variety of oral manifestations. Robert Heinz, a German physician, in 1890 described inclusions in red blood cells of patients with hemolytic anemia. They are named as Heinz bodies. Apart from hemolytic anemias, thalassemia and Glucose-6-phosphate dehydrogenase deficiency may also show Heinz bodies. They appear as small, irregular, deep purple granules in red blood corpuscles. Special stains like crystal violet and Wright's stain can be used to demonstrate these bodies. Heinz bodies are formed due to damaged DNA component usually through oxidation or due to change in the internal morphology of the amino acid residue within the red blood cells. These damaged cells are prematurely lysed and are removed by the macrophages. Leukemia with megaloblastic anemia and Pernicious anemia show small, dark staining round inclusions in the red blood corpuscles known as Howell- Jolly bodies. This presentation of red blood cells is due to the remnant of DNA left during the maturation in the bone marrow and was first noted by William Henry Howell and Justin Marie Jolly. These bodies appear basophilic and their ring like appearance in red blood cells mimics parasites. ,, Peripheral blood smears of patient suffering from homozygous type of Thalassemia show intracellular inclusion bodies known as Fessas body. Decreased production of β-chain hemoglobin occurs which thereby leads to excessive deposition of α-chain hemoglobin in the red blood cells. Defective production of hemoglobin leads to severe hypochromic type of red blood cells and increased deposits of α-chain hemoglobin leads to premature lysis of the cell wall of red blood cells. One of the most commonly encountered cystic lesions in the oral cavity is the periapical cyst. A frequent finding in this cyst is the presence of Rushton bodies/ Hyaline bodies. 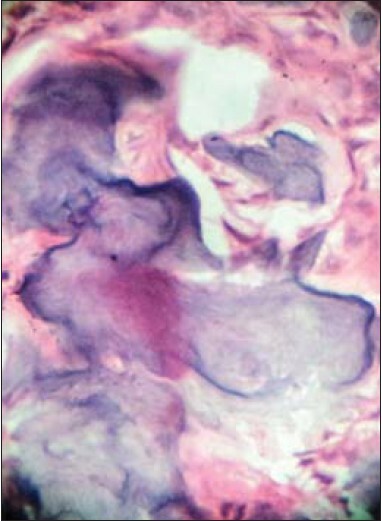 In H and E stained sections, Rushton bodies/ Hyaline bodies appear as eosinophilic bodies showing varied shapes which are- linear, straight, curved, hairpin shaped, circular or polycyclic forms [Figure 4]. They often appear as having a granular core and sometimes are concentrically lamellated. Rushton bodies/ Hyaline bodies are found almost always within the epithelial lining and only rarely in the fibrous capsule. Ultrastructural examination reveals two forms- lamellated and homogeneous. The lamellar type is composed of alternating electron dense and electron lucent layers, the outermost layer always being electron dense. The granular type is composed of amorphous material in which fragments of red blood cells are seen. Some hyaline bodies are partly granular and partly lamellar. The surfaces of the epithelia in both the types show large number of hemidesmosomes, but no basal lamina. Amorphous material in the granular hyaline bodies appears very similar to the substance of the degenerating red blood cells, and extravasated red cells commonly found in the adjacent connective tissue. As disease progresses, various changes occur in the body which are biochemical in nature which lead to cellular changes. These cellular changes are visible at different stages of disease progression. As the presence of histopathological bodies is indicative of a disease; their disappearance is indicative of subsidence of the disease. The occurrence of these histopathological bodies at various stages in the course of the disease can be useful in staging of the diseases. Histopathological bodies in oral pathology have a great deal of significance in diagnosis of the diseases. These features are often indicative of etiology of the disease and some of these are pathognomonic. In blood disorders, these pathological bodies represent the damage to hemoglobin or remnants of DNA. The biochemical nature of these bodies represents the pathological changes in the metabolism of the cell. The histopathological bodies are significant for diagnosing, staging, treatment planning and also predicting the prognosis of the disease. The present paper is an attempt to compile histopathologic bodies, categorize them and systematically. 1. Svane-Knudsen V. Stratum corneum barrier lipids in cholesteatoma. Acta Otolaryngol Suppl 2000;12:139-42. 2. Lowenstein CJ, Morrell CN, Yamakuchi M. Regulation of weibel-palade body exocytosis. Trends Cardiovasc 2005;15:302-8. 3. Easton JA, Fessas C. The incidence of dohle bodies in various diseases and their association with thrombocytopenia. Br J Haematol 1966;12:54-60. 4. Weiner W, Topley E. Dohle bodies in the leucocytes of patients with burns. J Clin Pathol 1955;8:324-8. 5. Available from: www.http://microblog.me.uk/167. [Last accessed on 2012 Oct 15]. 6. Sangster A. Non-glandular theory of origin of molluscum contegiousum. Lecture on skin diseases at Charing cross Hospital; 1880. 7. Available from: http://www.mondofacto.com. [Last accessed on 2012 Oct 15]. 8. Eyons AS, Kaslow RA. Viral Infections of Humans: Epidemiology and Control. British Journal of Biomedical Science. June 1, 1998; 1029;813. 9. Antonio C, Slootweg PJ. Pathology of the head and neck; Vesiculo-bullous Diseases, 1999;72. 10. Available from: http://www.humpath.com/cowdry-type-B-nuclear-inclusions [Last accessed on 2012 Feb 8]. 11. Mattes FM, McLaughlin JE, Emery VC, Clark DA, Griffiths PD. Histopathological detection of owl's eye inclusions is still specific for cytomegalovirus in the era of human herpesviruses 6 and 7. Clin Pathol 2000;53:612-4. 12. Rajendran R, Shivapathsundharam B. Shafer's Textbook Of Oral Pathology. 6 th ed. Mycotic Infections of Oral Cavity. p. 369. 13. Berson SD, Brandt FA. Primary pulmonary sporotrichosis with unusual fungal morphology. Thorax 1977;32:505-8. 14. Ben ZP. Head and neck surgical pathology; Soft Tissue Pathology of Head and Neck. 1997. p. 397-419. 15. Ohno J, Iwahashi T, Ozasa R, Okamura K, Taniguchi K. Solitary neurofibroma of the gingival with prominent differentiation of Meissener bodies: A case report. Diagn Pathol 2010;5:61. 16. Keating RF, Goodrich JT, Packer RJ, et al. Tumors of the pediatric cetral nervous system; Chapter 25; Intracranial meningioma. p. 356. 17. Enzinger FM, Weiss SW, et al. Soft Tissue Tumours - 3 rd ed. Chapter 31; Benign Tumors of Peripheral Nerves; p. 860-1. 18. Simansky DA, Aviel-Ronen S, Reder I, Paley M, Refaely Y, Yellin A. Psammomatous melanotic schwannoma: Presentation of a rare lung tumor. Ann Thorac Surg 2000;70:671-2. 19. Sorbe B, Frankendal B. Prognostic importance of psammoma bodies in adenocarcinomas of the ovaries. Gynecol Oncol 1982;14:6-14. 20. Solomon MC, Khandelwal S, Raghu A, Carnelio S. Psammomatoid Juvenile Ossifying Fibroma of the Mandible- A Histochemical insight. Internet J Dent Sci 2009;7. 21. Tazawa K, Tsutsumi Y. Localized accumulation of Russell body- containing plasma cells in gastric mucosa with Helicobacter pylori infection: 'Rusell body gastritis'. Pathol Int 1998;48:242-4. 22. Everson AG. The nature of Russell bodies and kurloffbodies. J Clin Path 1949;2:81. 23. Iwamoto T, Witmer R. Light and electron microscopy on plasma cells and Russell bodies in the iris of a chronic uveitis patient. Invest Ophthalmol 1969;8:563-82. 24. Leonard EP, Lunin M, Provenza DV. On the occurrence and morphology of Russell bodies in the dental granuloma: An evaluation of seventy-nine specimens. Oral Surg Oral Med Oral Pathol 1974;38:584-90. 25. Epstein DS, Pashaei S, Hunt E Jr, Fitzpatrick JE, Golitz LE. Pustulo-ovoid bodies of Milian in granular cell tumors. J Cutan Pathol 2007;34:405-9. 26. Sulit DJ. Spitz Nevus. Dermatology Review.com Journal 2005;1- 6. 27. Philip E. LeBoit. Pathology and genetics of skin tumours, Vol. 6. Ch. 2. Melanocytic Tumors;59,115-7. 28. Wang E, Kulbacki E. Diffuse large B-cell lymphoma with ditcher bodies. Eur J Haematol 2010:85:180. 29. Gray Y, Stanley S, et al. Dutcher bodies in chronic synovitis. Arch Pathol Lab Med 2002;126:199-201. 30. Hosokawa M, Masu S, Seiji M. Immunofluorescence studies on civatte bodies and dyskeratotic cells with anti-keratin antibody. Tohoku J Exp Med 1981;135:219-29. 31. Masu S, Sato A, Seiji M. Electron microscopic studies on civatte body in Riehl's melanosis. Tohoku J Exp Med 1980;131:177-96. 32. El-Labban NG , Ivor RH. Kramer Civatte bodies and the actively dividing epithelial cells in oral lichen planus. British Journal of Dermatology 1974;90:13-23. 33. Morita M, Sakaguchi H. Ultrastucture of renal glomerular hematoxylin bodies. Uitrastruct Pathol 1984;7:13-9. 34. Grishman E, Churg J. Ultrastructure of hematoxylin bodies in systemic lupus erythmatous. Arch Pathol Lab Med 1979;103:573-6. 35. Available from: http://focosi.altervista .org/pathohomoprocess regressive.html [Last accessed on 2012]. 36. Rosen Y. Pathology of Sarcoidosis. Semin Respir Crit Care Med 2007;28:36-52. 37. Violeta Mihailiovic-Vucinic, Sharma OP. Atlas of Sarcoidosis: Pathogenesis; Diagnosis and Clinical features; Diagnosis of Sarcoidosis; p. 10-11. 38. Jacob HS, Winterhalter KH. The role of hemoglobin heme loss in Heinz body formation: Studies with the partially hehe deficient hemoglobin and with genetically unstable hemoglobin. J Clin Invest 1970;49:2008-16. 39. Dawson DW, Bury HP. The significance of Howell-Jolly bodies and giant metamyelocytes in marrow smears. J Clin Path 1961;14:374. 40. Kahawash E, Gewirtz AS. Howell-jolly body-like inclusions in neutrophils. Arch Patho Lab Med 2003;127:1389-90. 41. Available from: th http://www.accessmedicine.com/howell-jolly body. [Last accessed on 2012]. 42. Shear M, Spieght P. Odontogenic Keratocyst. In Cysts of Oral and Maxillofacial regions. 4 th ed. Oxford: Blackwell Munksgaard; 2007. p. 123-42. 43. Philippuou S, Ruhl GH, Mandelartz E. Scanning electron microscopic studies and x-ray microanalysis of hyaline bodies in odontogenic cysts. J Oral Pathol Med 1990;19:447-52. 44. Yamaguchi A. Hyaline bodies of odontogenic cysts: Histological, histochemical and electron microscopic studies. J Oral Pathol 1980;9:221-34. 45. Takeda Y, Kikuchi H, Suzuki A. Hyaline bodies in ameloblastoma: histological and ultrastuctural observations. J Oral Pathol 1985;14:639-43.